Located in the main Catholic temple of Buenos Aires, it symbolizes the fraternity between the two religions. This is its fascinating history. Today, March 17, marks the 27th anniversary of the attack on the Embassy of Israel in Buenos Aires in 1992. 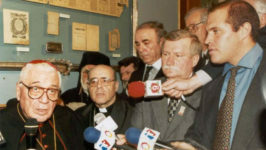 Five years after the tragic event, in April 1997, a unique initiative of the Raoul Wallenberg Foundation came alive, implemented by then Archbishop of Buenos Aires, Antonio Quarracino. A mural was installed inside the Metropolitan Cathedral, dedicated to the victims of the Holocaust and the attacks against the Embassy of Israel and the Argentine Israelite Mutual Association (AMIA), which occurred in that same decade, leaving a dramatic number of dead and wounded. This symbol of fraternity between Catholics and Jews, unique in the world, is based on an idea belonging to Baruch Tenembaum, the founder of the Raoul Wallenberg Foundation, an NGO that disseminates the heroic legacy of the rescuers of victims of the Shoah, among whom, the Swedish diplomat Raoul Wallenberg stands out for his prominence and tragic personal history. In just eight months Wallenberg saved thousands of lives in Nazi-occupied Hungary. On January 17, 1945, he was arrested by the Soviet Army, never to be seen again. 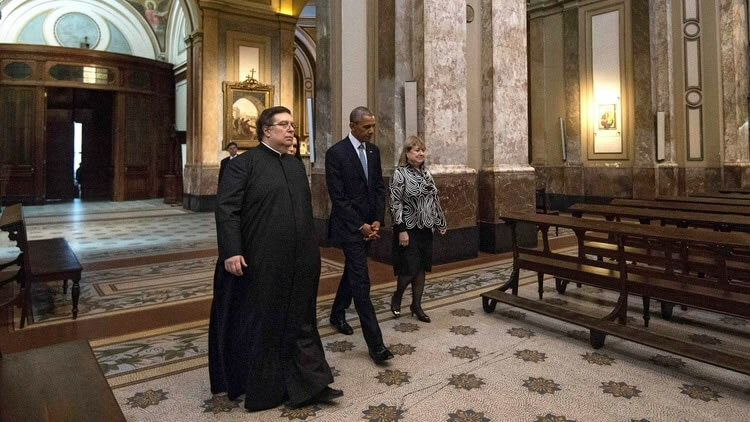 For his interfaith work Monsignor Antonio Quarracino was awarded the Jerusalem Ecumenical Prize in Israel. Antonio Quarracino was born in 1923, in Pollica, a small town in southern Italy. When he was 4 year old his family emigrated to Argentina. In 1962, Pope John XXIII appointed him Bishop of Nueve de Julio. In 1985, Pope John Paul II promoted him to the Archdiocese of La Plata and then to that of Buenos Aires, making him the primate of Argentina. The spirit of fraternity that Monsignor Quarracino felt for the Jews manifested itself in a palpable way through the mural, an unprecedented symbol of interfaith. The inauguration of the mural, which took place on April 19, 1997, coinciding with the 54th anniversary of the Warsaw Ghetto uprising, was attended by dignitaries, political and religious leaders from various countries, including Lech Walesa, the Nobel Peace Prize laureate, who two years before had finished his term as president of Poland, a country facing anti-Semitic accusations mainly for the narrative it tries to impose on the role played by the Poles during the Shoah. The mural is a structure 1.80 meters tall by 1.20 meters wide, composed of two crystals between which prayer book sheets found in Auschwitz, Treblinka and the Warsaw Ghetto are displayed. 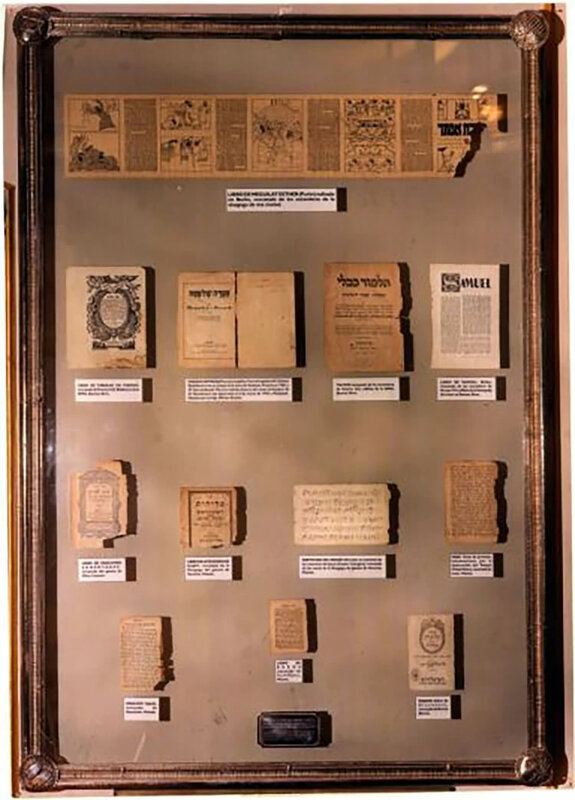 A Kaddish score (the Jewish prayer for the dead) can also be seen as well as the covers of two books: one of fables, in Yiddish, found among the rubble of the AMIA and another, from the Book of Samuel, found in the ruins of the Embassy of Israel in Buenos Aires. 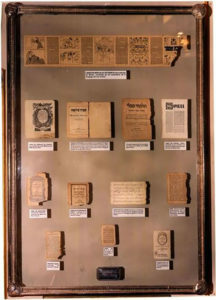 The piece is complemented by a copy of the Passover Hagada, rescued from a concentration camp in 1942, donated by Miriam Kesler, daughter of one of the victims. Inner plaque reads: “In memory of our Jewish brothers assassinated and annihilated during the Shoah (Holocaust) and the martyrs of the attacks on the Israeli embassy in Buenos Aires and the Argentine Israelite Mutual Association (AMIA). Archbishop of Buenos Aires, Primate of Argentina, Cardinal Antonio Quarracino, endorsed on April 14, 1997, in Buenos Aires, Argentina “. 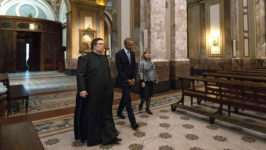 The mural was visited throughout its short history by prominent personalities from Argentina and the world, including President Raúl Alfonsín; President Barack Obama; Cardinals John O’Connor and Angelo Sodano; Archbishop of New York; Secretary of State of the Vatican; the Nobel Peace Prize, Lech Walesa; and the French intellectual Guy Sorman, among others; in addition to the students of numerous schools, and more than three thousand people who visit the main Catholic temple of Argentina every day. After the death of Quarracino, his successor, Jorge Mario Bergoglio, continued the task of preservation and dissemination of the mural, following the express wish of his mentor and predecessor. In September 2004, the Raoul Wallenberg Foundation placed a replica of the mural in the Protestant Evangelical Vaterunser Church in Berlin.